It is the heartbeat of your home and everyone passes through it. You fix coffee and breakfast there. Snacks, lunch, and dinner require your presence in this room. You may not even be doing anything food related, but you probably find yourself in this room more often than any other room of the house. Every time you are in the kitchen, do you notice all the things that bug you about the space? There never seems to be enough time or money to make changes in the kitchen to fix the things that irritate you. So you live with it because it is functional and you can do what needs to be done. Most of us spend quite a bit of time in the kitchen. Many of us have changes we would make there, too, if time or money wasn’t an issue. If a kitchen remodel isn’t in your near future, consider a few fun changes that would take your attention away from what bugs you and instead focus it on something that brings you happiness. Fabric, other fibers, and mementos from the past can make time in the kitchen a more enjoyable experience. You might even feel a connection to women who lived in a simpler time and loved and cared for their families like you do. One: Use items that previously belonged to a relative or friend. 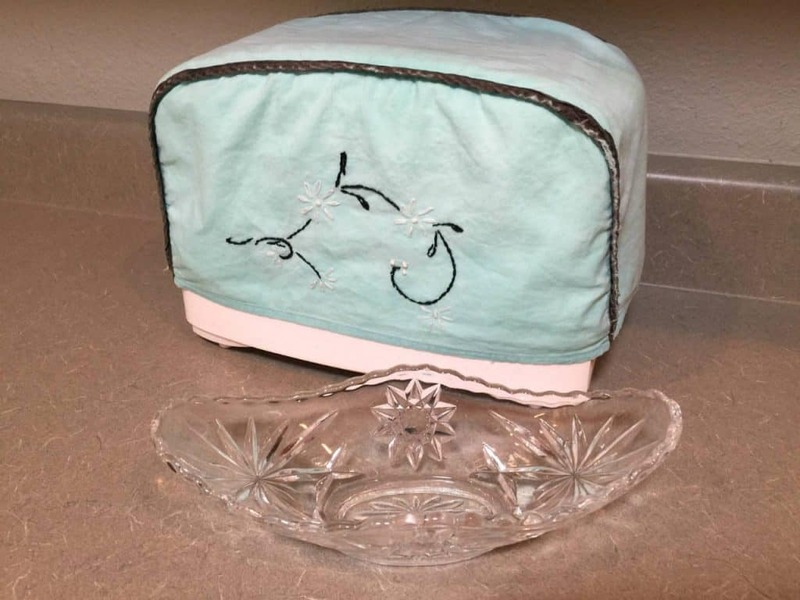 When you are able to use something in your kitchen that belonged to a cherished relative or friend, there is a small mental zing and a flash of memory that passes through your mind every time you use it. It is a spark that connects you to that person and leaves a comforting feeling of happiness in its wake. My grandmother had this fun sugar container with cute pink and purple flowers on it. There was a spoon that hung on the side to scoop out the sugar. She kept it in her 1950’s china cabinet with other special pieces. When I was visiting my grandparents in my early 20’s, I looked in the china cabinet at everything she had on display and told her how much I liked the sugar container. I don’t remember if she told me where she got it or who gave it to her. What I do remember is her walking across the dining room, carefully sliding the glass door of the cabinet open, her hands reaching in to pick it up, and then her giving it to me. I’m sure we exchanged words but I don’t remember those either. I remember her insisting I take it and our hands touching as she passed it to me. For a while, this cute sugar container sat on my kitchen counter next to the coffee pot. We used it to hold sugar for our morning coffee. At some point, we stopped using real sugar and started using artificial sweetener in packets. I remember putting Grandma’s sugar container away and feeling sad I wouldn’t be able to use the spoon to scoop out sugar for my coffee anymore. When I was in my 40’s, I came across the sugar container in the back of the kitchen cabinet. The same feelings I had when I first saw it came to the surface. I pulled it out of the cabinet. 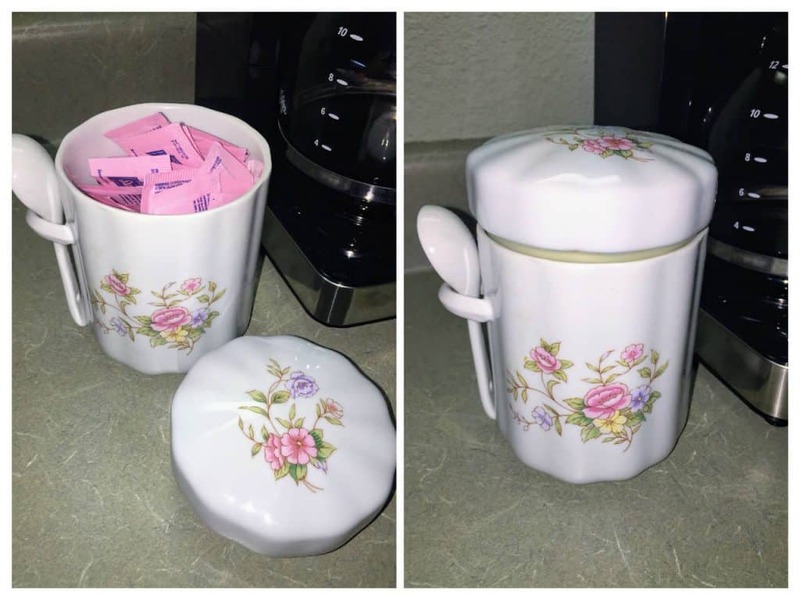 Looking at the generic container I had sitting on the counter holding the artificial sweetener packets, I had an epiphany…I could use Grandma’s sugar container to hold the packets instead! 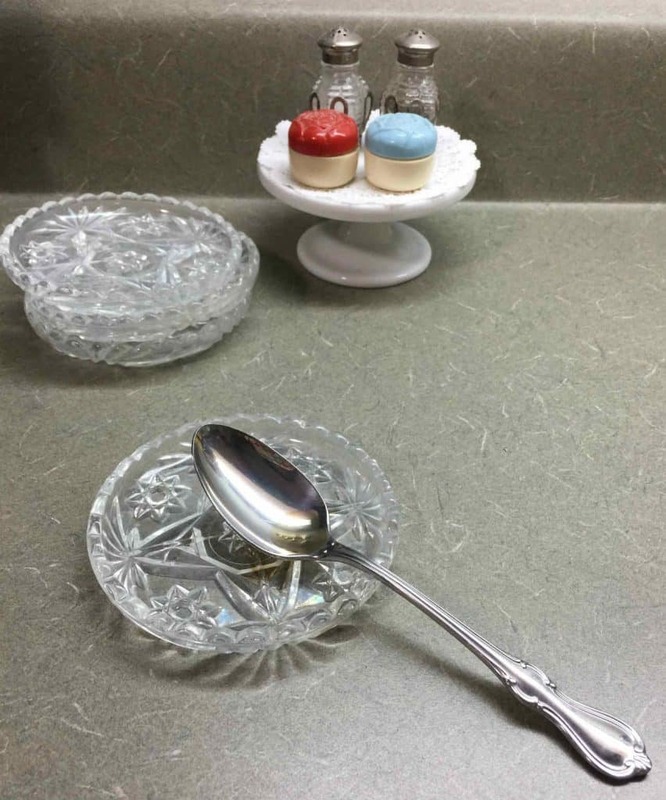 Sure, I wouldn’t be able to use the spoon but I could enjoy the sugar container every day if it was back out on the counter. I quickly moved the packets into Grandma’s container. It has been sitting on my kitchen counter ever since. 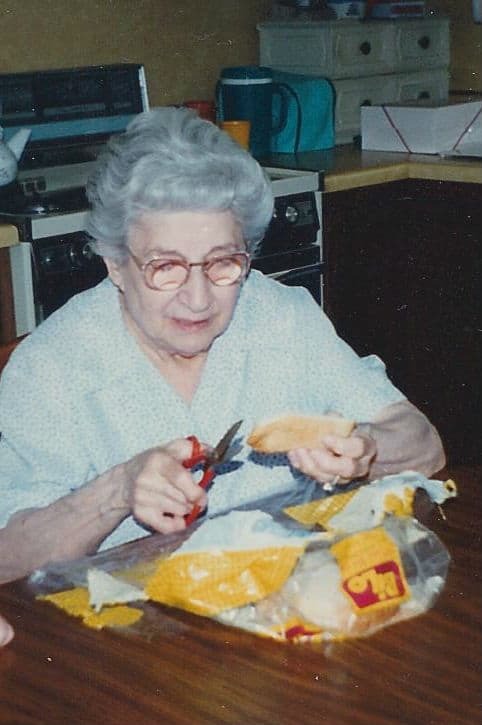 Like many women, Grandma spent a lot of time in the kitchen. In all my memories she is wearing an apron of some sort. As she got older, Grandma went from a traditional apron that she slipped over her head and tied behind her back to a sleeveless housecoat or duster she put on over her clothes and snapped up the front. When my grandparents had to move to an assisted living facility, my mom helped clean out their house. While she was moving stuff out of the attic, she came across a bag of aprons. My grandparents never threw anything away and it appeared as if my grandmother put every apron she ever had in the bag. My mom said there must have been 30 or more aprons! Mom told me there was a bright red apron covered in flowers that was still in good condition. Because I liked to wear aprons when I cooked, I asked her if I could have it. I still have aprons and there are several I take turns wearing. 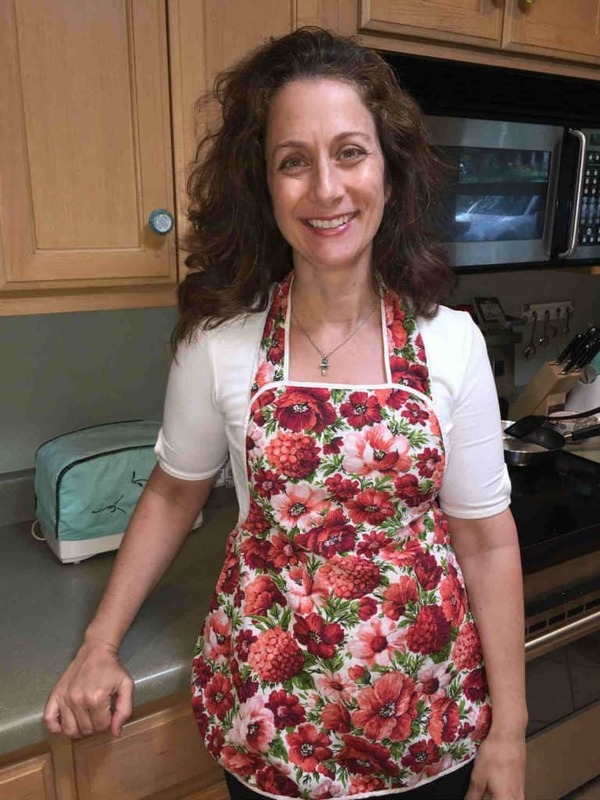 Whenever I put on Grandma’s red flowered apron, I feel an extra flash of happiness because it belonged to her. I’m not even sure how this came into my possession, but for years I have had a toaster cover that Grandma used. See the turquoise toaster cover on the counter behind my grandma? Even though Grandma had never been in the house I live in now, when I see or use items that used to be hers, I am reminded of her and the happy times spent visiting her and my grandpa. These flashes of memory make the time I spend in the kitchen more enjoyable. Two: Use glassware, china, or other dishes for something other than their original purpose. Every year for Thanksgiving when I was growing up, my mom sliced jellied cranberry sauce and served it in a glass dish shaped like the hull of a boat. She used the same dish every year. I loved that dish. At one point I remember telling her I wanted it when she died. Early on in my marriage, my husband and I were at an antique mall. Sitting in one of the booths was a dish exactly like the cranberry boat my mom had. It was only a few dollars. It was too good to pass up so I bought it. The next time I talked to my mom I told her I didn’t have to wait until she died to get the cranberry dish. I explained I found one just like hers at an antique mall. During our conversation, she told me someone had given her luncheon plates and large platter for her wedding in the same pattern. She told me she never used them and if I wanted them they were mine. I gladly took them off her hands. Before I knew it, I had started an unintentional collection of Anchor Hocking American Prescut glassware. Over the years I found bits and pieces and added them to my collection. Now, I believe I have almost all the pieces. Most of them sit together on a couple shelves in my pantry, but I repurposed a couple for everyday kitchen tasks. They add a little bit of visual joy to the humdrum routines of cooking and cleaning. There is a stack of American Prescut coasters by the stove. They have been repurposed as spoon rests. They are easy to grab when I need to keep a dirty utensil off the counter. Instead of keeping the scrubbing brushes under the sink, I repurposed a vase to hold them on the counter by the sink. They are easy to grab when I need to scrub dishes. 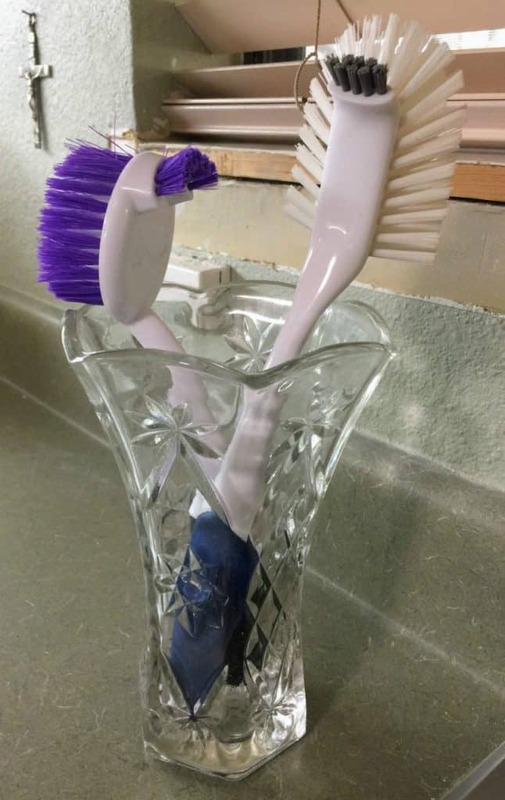 In addition, any water that is on the bristles after I use them is contained in the bottom of the vase. 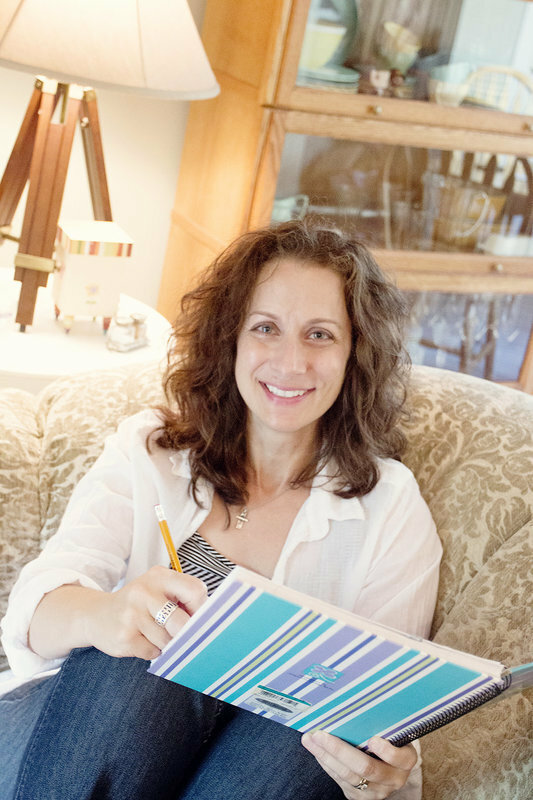 Three: Find items that bring joy and incorporate them into the kitchen. Colorful, unique handmade pieces frequently catch my eye when I am browsing through booths at antique malls. Several years ago I discovered a display of crocheted potholders. No two were alike. I don’t know if they are actually vintage but they definitely could be. They are colorful and delicate looking. It appears as if they were crocheted with thread. Someone (or several someones) had the skill and invested time into making them. They definitely should be used and enjoyed. So I selected three that complemented each other and brought them home. It didn’t seem practical to actually use them as potholders. They were just too pretty. I looked around the kitchen and thought about where I could use them and still see them every day. There is a three-tiered wire basket system hanging from the ceiling in my kitchen. It is plain black. Nothing fancy. It is used to hold fruits, vegetables, and sometimes accessories to my KitchenAid mixer. 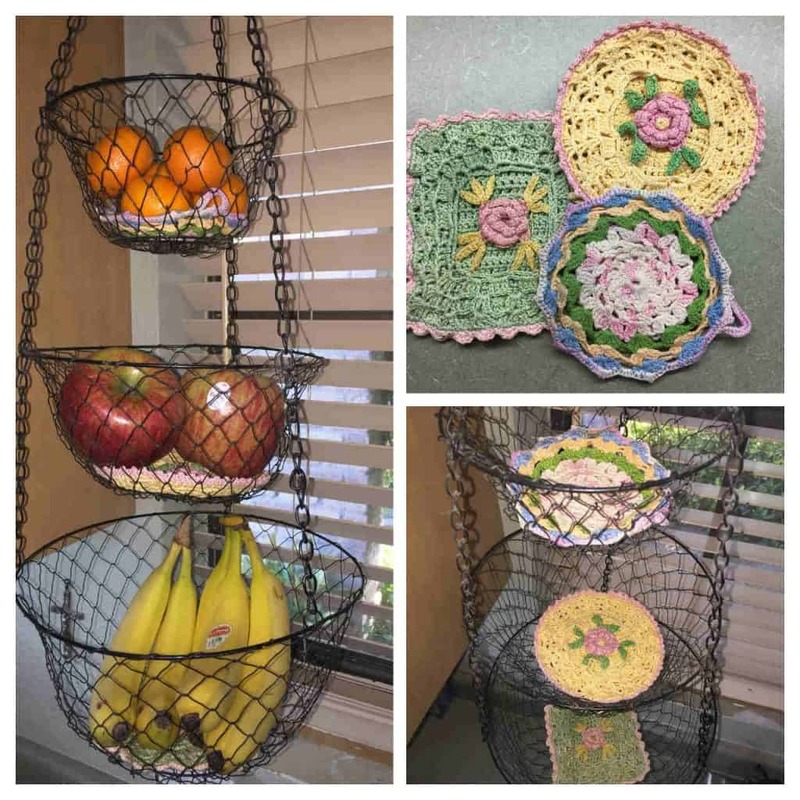 The crocheted potholders fit perfectly to line the bottom of each basket! Small changes can have a big impact. By using fabric, other fibers, and mementos from the past you can make your time in the kitchen an enjoyable experience. What items do you own that you love and evoke a warm memory of a relative or friend? These items may not have been originally made for the kitchen but that doesn’t mean you can’t repurpose them for a kitchen related need. Do you have a glassware collection that has some unique pieces? How can a piece or two of your collection be repurposed to help you do everyday kitchen jobs? What types of items make you feel good when you see them? Consider places in your kitchen where they could serve a function and be enjoyed. Do you have mementos that remind you of someone you love? What brings you joy when you see it? Keep these questions in mind as you mull over what small changes you could make in your kitchen to make your time there more enjoyable.